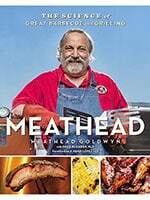 Love grilling seafood in the Summer? These shrimp teriyaki skewers are a fantastic and delicious way to celebrate the season. 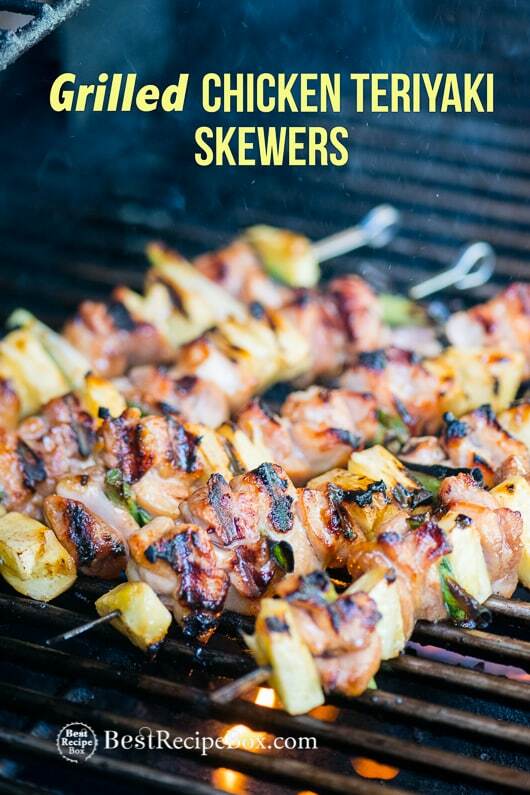 Previously our chicken teriyaki skewers with Pineapple and our chipotle Shrimp skewers were so popular, we realized we wanted to test our a teriyaki shrimp recipe on skewers too. And boy, we’re so glad we did. The teriyaki sauce on the shrimp is fantastic, especially when it’s cooked to a nice crisp and char on the grill. 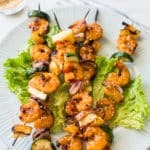 If you’re a seafood lover and looking for a great Summer shrimp recipe to cook on the grill or bbq, this shrimp teriyaki skewers recipe is it! The sweet pineapple and veggies cooked in the teriyaki sauce is great, combined with the smoky char of the wonderful shrimp teriyaki skewers. Sometimes grilling isn’t always just about red meat and grilling shrimp kebabs is a ways to celebrate seafood on the grill! 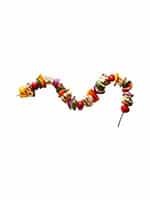 Add a few of these skewers to some rice, on top of a green salad or with a side of potato salad or coleslaw. 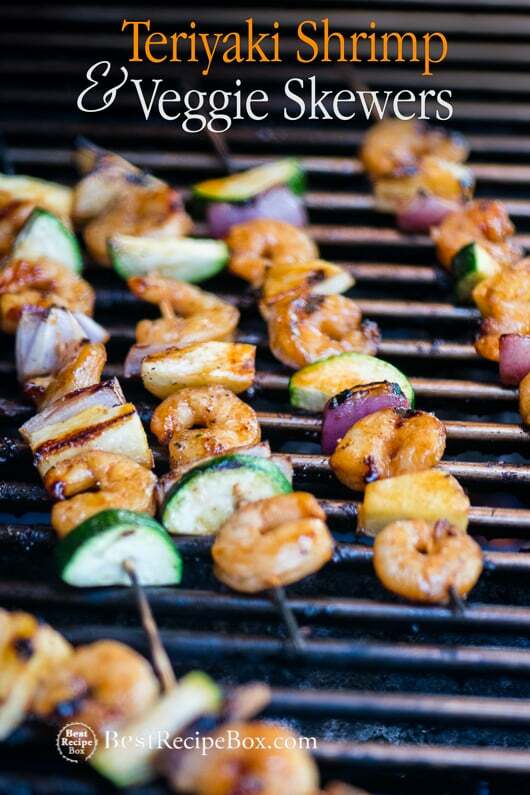 Everyone who loves to eat shrimp will thank you for making seafood as the hero of the grilling party! 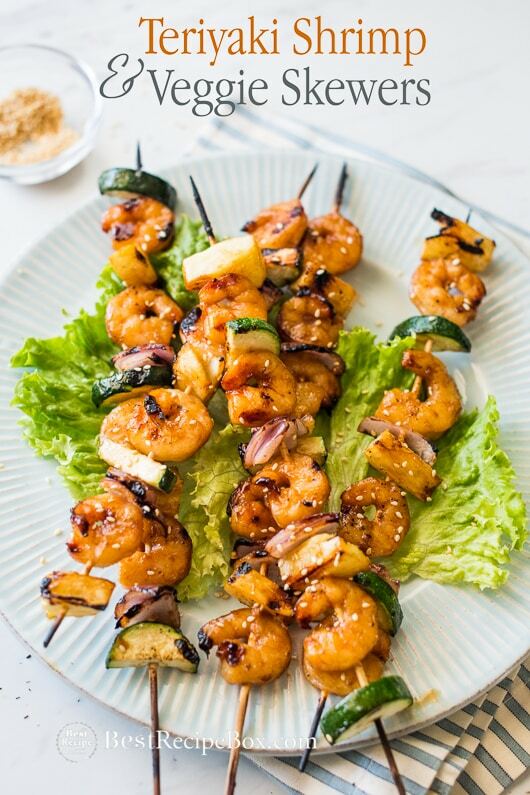 enjoy these shrimp teriyaki skewers this Summer! 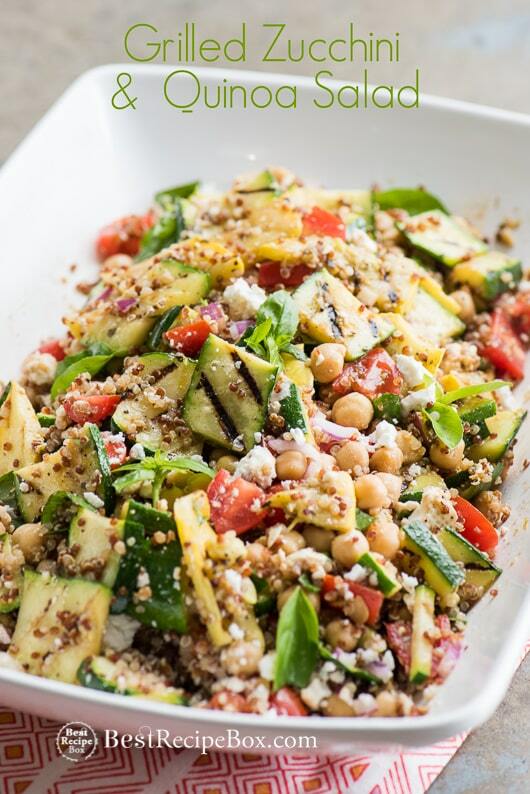 Here’s a great Summer watermelon salad recipe that’s refreshing and delicious. 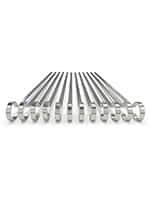 Stainless Steel Kebab Skewers: Our skewer go-to. 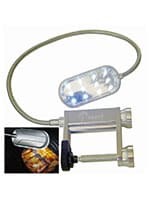 No more soaking to keep the skewers from burning. The flat edge makes flipping easy. 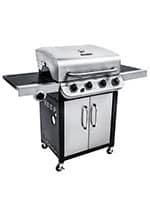 Grilling Wire Skewers– The flexibility of the wire skewers makes it easy to wrap the skewers onto the best part of the grill. 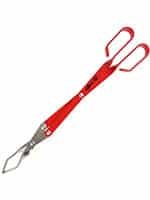 Perfect for skewers you are going to remove from the skewer after grilling and serve plated or in tacos or other delicious dishes. 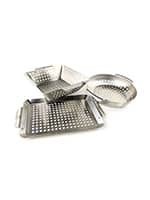 Grill Baskets – Some days we just don’t want to bother with skewering every single thing. Throw them all into a basket and grill from there. Easy-peasy. Love these basting brushes. Clean up easy, holds a solid amount of sauce. They are our basting go-to’s. If using wood or bamboo skewers, soak the skewers completely in water for at least 30 minutes. 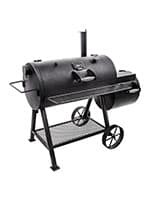 This will help minimize the wood/skewers from burning. There’s lots of veggie options, so add what ever you like. We loved having pineapple, zucchini and onion. In bowl combine olive oil, teriyaki sauce, garlic powder/minced garlic and onion powder. Whisk until combined. 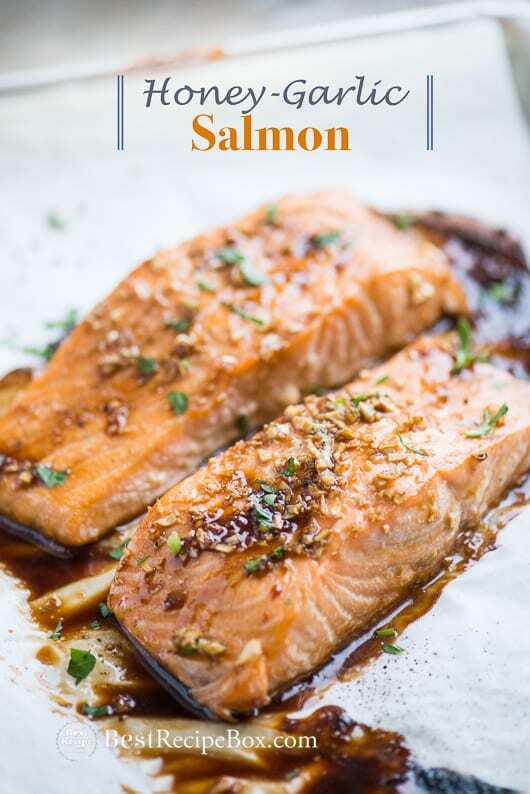 Set aside a tablespoon or two of the marinade for brushing after cooking. Add shrimp into the rest of the marinade, then cover the bowl and marinate in the fridge for at least 30 minutes. Pre-heat grill to high heat. Scrape the grill grates to make sure they are clean. Skewer the shrimp, zucchini, onion and pineapple on the skewers. Brush extra marinade on the skewers, especially over the vegetables. Season with salt and pepper to taste. Grill the skewers for about 2-4 minutes per side, or until slightly charred and cooked through. Brush additional fresh teriyaki sauce (not the marinade the raw shrimp was in) over the skewers. Sprinkle sesame seeds and cilantro. Enjoy!